James A. Brickey was the son of William Brickey and Elizabeth Cox. He was born 23 May 1819 in Scott Co., VA, and died 14 Aug 1896 in Scott Co., VA. 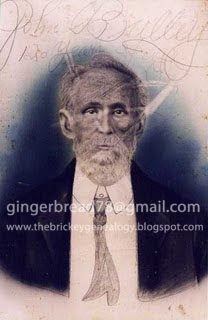 He married Jalia Green 18 Mar 1840 in Scott Co., VA, daughter of James Green and Dulcenia Stallard. She was born 14 Mar 1821 in VA, and died 27 Mar 1900 in VA. . He had a son with Matilda Sloan, who was listed as a servant in census records with him and his wife, Jaley/Jalia. Matilda was born Feb 1850 in VA, and died 1910 in TN. James and Jalia are buried in Scott Co., VA on a hill.